In this excerpt from the video "How To Listen: Reverb Edition," Fab DuPont begins by playing back a soloed female vocal singing a soft melodic line through a UAD EMT 140 plate reverb plug-in. After playback, he observes that the reverb sounds metallic, but not in the annoying sense. Instead, he says it sounds like, "a lush, big piece of matter just vibrating." And that's exactly how a real plate reverb works. It's constructed of a large piece of metal, suspended with springs inside an outer casing. The metal plate has a transducer (which functions as a speaker) attached to it that reproduces the sound sent to it from the console, causing the metal plate to vibrate. The result is picked up by a contact microphone that's also attached to the plate, and returned to the console. In this video, Fab compares the EMT Plate 140 plug-in with an actual reverb plate. Next, Fab says he's going to compare the sound of the UAD EMT 140 with the sound of a real plate reverb, which he has access to in the studio he's working in. He first plays the vocal through the plug-in and then the actual plate. The plate sounds a little richer and decays a bit longer. Fab then adjusts the decay time on the plug-in to make it a little longer, to about 4 seconds. He also removes the high-pass filter that was set to 125 Hz, in order to add little more body to the reverb. After that, he compares the two again, and they are really close. His takeaway is that the UAD plug-in is "pretty badass." He points out that whether you're using a real plate or a plug-in (for most of us, it will be the latter), you get a nice initial bloom and then a smooth-sounding tail that thins out as it decays. These days, you don't need a big, expensive and bulky plate reverb in your studio. You can get a very close approximation via the algorithms of a digital reverb plug-in. The first digital reverbs were hardware units, which began appearing on the scene in the mid-1970s. Before then, the three main types of hardware reverbs were all electro-mechanical: plates, chambers and spring reverbs. 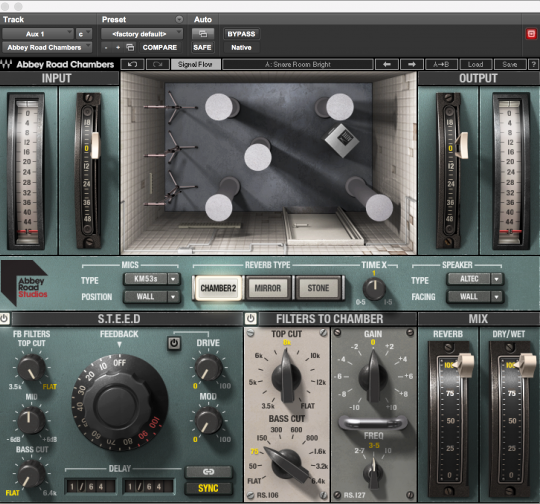 The recently released Waves Abbey Road Chambers plug-in was modeled from the actual reverb chamber at Abbey Road Studios and also offers models of two other echo chambers. Reverb chambers (aka “echo chambers”) took up even more space than plates because they were actual rooms with reverberant properties. This is how they worked. A room with a hard surface, such as tile, glass or concrete, which produced lot of natural reflections was chosen or constructed. A loudspeaker was set up at one end and was connected to the mixing console. The sound to be reverberated was sent from the console to the speaker, and the sound to bounce around the room. The results were captured by a microphone or microphones and sent back to the mixing desk. The further back the microphones were placed from the speaker, the longer the reflections, and thus the longer decay time of the reverberated sound. Whether the speaker was placed close or far from the wall, also impacted the results. Spring reverbs tend to be thought of mainly as guitar-amp effects, as so many amps are equipped with them, but they were also used for studio reverb applications. Spring reverbs were housed in reverb "tanks," which were rectangular metal pans with metal springs attached to either end. The PSP Nexcellence is a spring reverb plug-in with a lot of sonic flexibility. A mono spring reverb unit would have two transducers, one to send the signal to the springs and convert it to sound waves that caused the springs to vibrate, and one to capture the resulting sound and transform it back into an electric signal to send to the console. Two notable spring reverb plug-ins are the UAD AKG BX20 and the PSP Nexcellence. Let's listen to the differences between reverb types, using plug-in emulations. When listening and comparing, think about the physical units that were being emulated and how they produced their sounds. EXAMPLE 1: Electric guitar with Valhalla DSP's Valhalla Plate reverb plug-in with a 2.5-second decay. EXAMPLE 2: Electric guitar with the UAD AKG BX20 spring reverb plug-in with a 3-second decay. EXAMPLE 3: Electric Guitar with Waves Abbey Road Chambers set to Chamber Two with the virtual speaker facing the wall. EXAMPLE 4: In this example, the snare drum is going through the PSP Nexcllence spring reverb plug-in with a 4-second decay. EXAMPLE 5: Here, the snare going through the Abbey Road Chambers reverb with the Snare Room Bright preset, which uses Chamber Two and the speaker set facing the wall. EXAMPLE 6: In this one, the snare is going through the UAD EMT 140 plate reverb, using Plate B with a reverb time a little over 2 seconds.